Cartright Hall is considered the very best art gallery in all of Bradford by aggregate websites. This is for a number of reasons. The most significant one is the fact that it has such a fantastic and vast collection of art pieces. The public are able to view these. The David Hockney Gallery resides within this hall. The artist is known for visiting this place during his youth. According to him it is the superior gallery in Bradford if you want to look at the most significant pieces of art. Because of this he has chosen Cartright Hall as the venue to show some of his most celebrated paintings. This gallery does not simply display his art. It also goes into detail on the life and techniques of the artist. 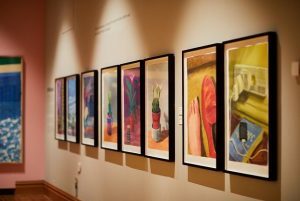 It allows the public to explore the early life of David Hockney and understand the things that influenced his work. It allows shows them how Hockney managed to physically achieve some of his most celebrated works of art. If you are an aspiring artist who wants to showcase your own work then the Cartright Hall has yet another reason for you to celebrate. It is able to host independent artist’s work. This art can be put on view to the public for a small hiring space price. It is not just the general public who have good things to say about the hall. It has received a number of awards from prestigious bodies, including the Museums and Heritage Award. Cartright Hall is well known for the fantastic workshops that help to educate both young and old on the history of art. It has a huge collection for prints which it has spent over a century amassing. This includes work by William Blake, Francisco Goya and modern art legend Andy Warhol.